Mayor Steven Scharf gave the annual State of the City Address on Wednesday, January 30. The mayor touched on a lot of topics that will impact City Hall and residents in 2019. Peppered with humorous quips and visuals, Cupertino Mayor Steven Scharf gave nearly identical State of the City Addresses to the public at the Quinlan Center on Wednesday. During lunch hour and evening events. Scharf covered a lot of ground in a short amount of time. He spoke about traffic, the library, the City’s fiscal health, housing, open space, resident engagement, and ways to make City Council meetings more enjoyable. His presentation, titled “Death by PowerPoint,” saw Scharf focus on some of Cupertino’s most pressing issues. He made mention of the Vallco Mall redevelopment saga and humorously conceded that constant questions from the public about the fate of the property were starting to wear on him. Scharf said he wasn’t quite sure what the future held for the former mall, though Sand Hill Property Company, the mall owner, is demolishing the property in phases to make way for the Vallco Town Center, which was approved by the City last year through new state housing legislation. The alternative Specific Plan approved by the former City Council in September is likely dead as it is in limbo due to a referendum. “Personally I would love to see a new Specific Plan that we could have the community be engaged in creating and that we could come to an agreement that everyone would have to give up a little, but everyone would get some of what they wanted. I don’t know if that can happen, but that would be my ultimate goal,” Scharf said. The mayor also took aim at the General Plan and State officials. He said the City’s General Plan needed to be cleaned up so “every parcel” has objective standards so the city isn’t dictated by State law. “This is really important because there’s a lot of harmful State legislation coming down the pike that we have to be ready for,” he said. He also bemoaned that so few housing units have been built after City approval and permits had been granted to developers and property owners. He said only 19 senior housing units at the new Veranda project have been built over the last few years. Scharf also said he wished there were more Extremely Low Income (ELI) housing units for the developmentally disabled in the City. “I think we’re in one of the richest areas in the world here, certainly we can find a way somehow where we can provide this needed housing. I’m sure we all have family or friends that are in this situation. We really have to find a way to do this,” he said. ELI units were part of a community benefit package offered by Vallco ownership if the Specific Plan project were built and not challenged by referendum or litigation. Scharf also said he wants the City’s current parks ordinance to be updated to have park space restricted to the ground floor. This would presumably prevent park space being built on roofs. Scharf took time to praise the library and its staff, but said more could be done to make it a better place. He cited its generally crowded nature, insufficient parking and lack of a “program room.” He suggested better bike lanes and more secure bike parking as tools to free up car parking spaces. He also wants the Santa Clara County Library District to consider prohibiting for-profit tutoring in the library to reduce crowding. 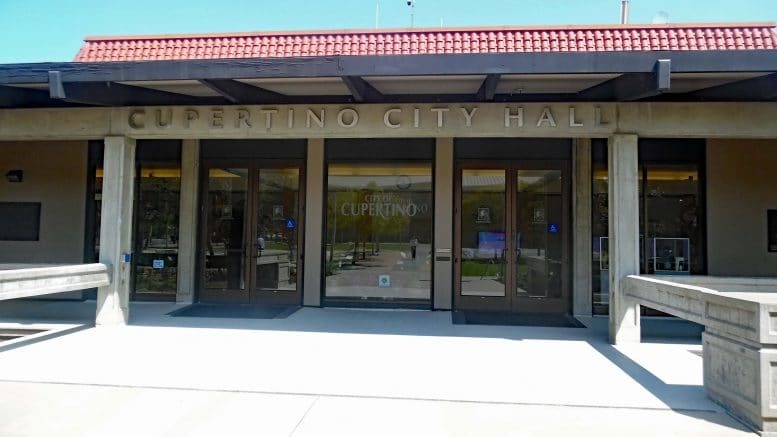 The mayor also said the City intends to tackle the truck traffic that runs between the two quarry operations near Foothill Boulevard, though he offered no specifics and Lehigh Cement is outside Cupertino’s jurisdiction. Truck traffic has seen an uptick after the County of Santa Clara said the mining operations could no longer use a private road connecting the properties. Finally, Scharf described lengthy City Council meetings as “soul crushing.” He said he’s asked staff to look into ways to make oral communications shorter, move council reports to the beginning of the meeting and make staff reports before shorter. Both speeches can be heard on the city website by clicking here. Be the first to comment on "Mayor Steven Scharf gives State of the City Address twice"